Over 3,000 years ago, the source of Mauritius was discovered, and 500 years ago classified by Paracelsus as medicinal water. 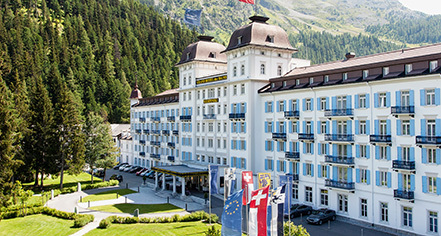 In 1864, the "Grand Hotel des Bains" was built as a spa hotel and this opened the door for the well-to-do guests to lead the cure to St. Moritz and to establish themselves as a meeting point for the "Haute Volée" of Europe. The first reconstruction work began in the early 20th century and highlighted the unique architectural styles - Mediterranean, Neo-Baroque, Neo-Gothic, and Biedermeier. The latest renovations in 2001 sought to combine the traditional elements with modern interiors. 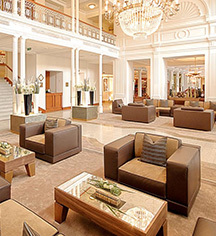 The Kempinski Grand Hotel des Bains offers a warm welcome as the gateway to the spectacular St Moritz. Situated in the Upper Engadine and easily accessible by road or rail, the hotel offers five-star luxury in a breathtaking mountain setting. Enjoy dining at three gourmet restaurants, deep relaxation at Kempinski The Spa, restful nights in the 184 comfortable guestrooms and suites and 27 luxury residences, and hundreds of miles of pristine slopes on your doorstep. The Kempinski Grand Hotel des Bains St. Moritz is the only five-star hotel in St. Moritz with direct access to the cross-country skiing area and is located immediately opposite of the cable car station to the ski and biking region of Corviglia. The hotel is open for the winter season from December until April, and for the summer season from June until October. Kempinski Grand Hotel des Bains St. Moritz, a member of Historic Hotels Worldwide since 2016, dates back to 1864. The property was originally made famous as the site of a mineral spring discovered 3,000 years ago, which is the foundation for the modern spa. Cancellation Policy: Cancellations must be made 72 hours prior to arrival. Cribs and Pack-in-Plays: Available upon request; CHF 150 per night. Parking: Self-parking: Available; CHF 35 per night (in/out privileges). Valet parking: Available; CHF 35 per night. Payment: All forms of payment are accepted. Payment is required at time of booking. Visa, MasterCard, and Amex are accepted. Pet Policy: Service animals allowed: Yes. Pets allowed: Yes. Restrictions: Dog Friendly. Fees: CHF 50 per day. Rollaways: Available upon request; CHF 150 per night. Shuttle Service: Shuttle service to and from the airport may be scheduled through the resort's concierge. CHF 1000 per vehicle (one way) Complimentary shuttle service may arrange to and from St. Moritz train station. Transportation: Limo/Town Car service available. Over 3,000 years ago, the source of Mauritius was discovered, and 500 years ago classified by Paracelsus as medicinal water. In 1864, the "Grand Hotel des Bains" was built as a spa hotel and this opened the door for the well-to-do guests to lead the cure to St. Learn more about the History of Kempinski Grand Hotel des Bains St. Moritz .